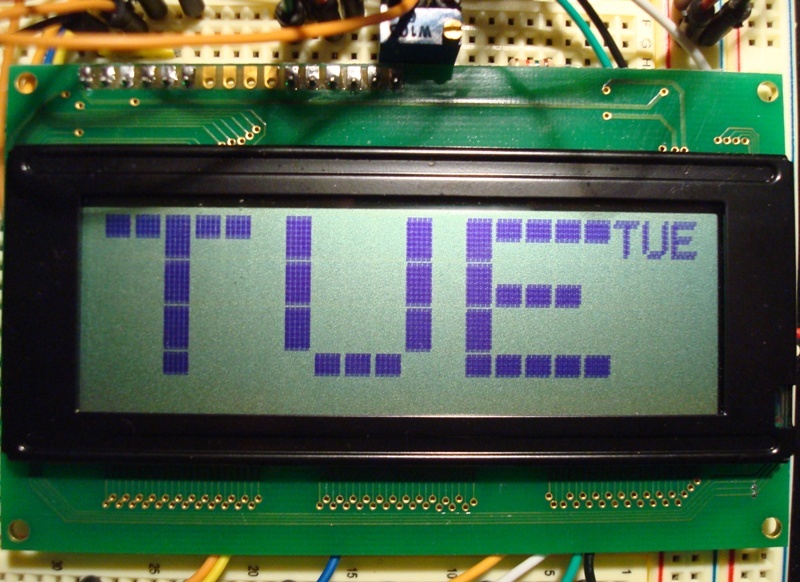 After some requests and inquiries on arduino forum, I decided to make big fonts for character LCDs, not just numbers, as seen in some examples, but numbers, and characters, so you can display a few large characters and see them from say 10 feet away. With the request from my blog reply, I pushed the envelop a bit more and developed super font to further increase the size of the characters to fully use 20X4 display areas. I initially made phi_big_font. Read this page with videos. I was successful so I pushed for super font. After some more work, now I present you phi_super_font library. If inv is true, all subsequent output is inverted with black background. Clears the LCD, except if it is inverted, fills it with black boxes. Displays string message at screen location loc_x and loc_y (top left corner of the message). You need to supply the string AKA character array’s name to the function. Display a number at location supplied. This is the same as the render_super_msg except you supply a string stored in PROGMEM. This displays a character ch at the supplied location. This displays the top row of a character ch at the current location. This displays the second row of a character ch at the current location. This displays the third row of a character ch at the current location. This displays the bottom row of a character ch at the current location. This displays a raw image of 20 wide by 8 tall on a 20 X 4 display. Each byte in the array represents a column of 2 pixels. The row order is 0, 2, 1, 3. };// line 0, 2, 1, 3 order. display_img(img1); // This is the Arduino symbol, flipped left and right to avoid copyright stuff. Then close all Arduino IDE windows. Add symbols to the font to map HD44780 symbols such as left and right arrows, also add more symbols for physics use. Is possible do that in Raspberry PI with I2C ? If you can write a program to receive command from Raspberry PI via IIC and then call the phi_super_font library, then it’s easy to do. I am not familiar with IIC program with RPI. I'll get my updates this summer. Google code site that hosts my code is shutting down for good. I'm moving to github. Hi. Is possible do that in 20×4 LCD with I2C? open C:\Program Files\Arduino\libraries: The system cannot find the file specified. Not sure what your error message means. Did you restart arduino after installing the library? Libraries should be in arduino’s sketchbook folder under libraries, not in some sketch_dec05a. Did you read the instruction on how to install?